Cap vs. Iron Man: Who Has The Better Teammates? While Batman v. Superman: Dawn Of Justice may have tanked with critics, its performance at the box office has proven that these kinds of battles are something fans want to see. Globally, the film raked in over $420 million in its opening weekend—an all-time record for a pre-summer release. 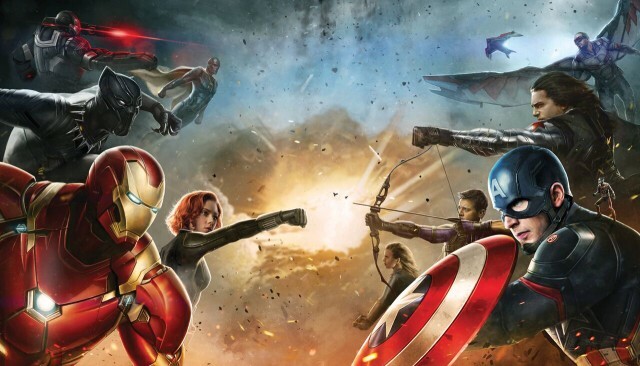 But if you think that’s a big opening weekend, just wait until Captain America: Civil War comes out this May. Superhero fans all over the world may adore Batman and Superman—they’re arguably the two biggest names in comics—but Marvel has nearly a decade’s worth of successful build-up to work with. That right there made Civil War the most hotly anticipated movie of the year. The fun thing with this one, too, is that it’s not just about two signature heroes opposing each other. Yes, Captain America and Iron man will go head-to-head; but it’s not civil “fight” or something of that nature, it’s civil war. Each character will essentially command a squad of other Avengers and sidekicks as they face off over whether or not to cooperate with the “Superhuman Registration Act” regulating hero activity. Marvel revealed the teams last year, so let’s break down which side has the advantage, aside from Cap and Iron Man themselves. Each team has a female agent who at one point or another has been associated with S.H.I.E.L.D. Incidentally, both have pretty close ties to Captain America as well. That’s led some to believe that Black Widow—a member of Team Iron Man—could be a double agent. For now, however, we’ll assume they stay on their respective teams, and between these two it’s hard not to give the edge to Black Widow. Agent Carter/Agent 13 is a popular Cap ally, but she has had nowhere near impact Black Widow has had on the Marvel Cinematic Universe. Black Widow is seemingly more powerful and more important, not to mention a majority of fans will probably be pulling for Scarlett Johansson. Edge: Black Widow (Team Iron Man). These are the characters that Captain America and Iron Man essentially created. Cap appears to be on a mission to free the Winter Soldier and turn him from villain to hero, and Iron Man basically invented The Vision to counter Ultron. But which of these intentionally empowered heroes gives his side more of an edge? Frankly, it’s hard to argue for anyone over The Vision. He seemed to be borderline all-powerful. But for cinematic purposes, the Winter Soldier is probably the greater asset. He’s Cap’s best friend, and the trailers show the two working together more than any other two characters. Edge: Winter Soldier (Team Cap). Falcon is probably the closest thing Cap has to a legitimate sidekick to this point. But War Machine is by now a full-fledged partner-in-crime to Iron Man. While Falcon feels almost as if he was tossed in just to give Cap someone to chat with during battles, War Machine has been through three Iron Man films. He has also become a signature part of the Iron Man branch of the MCU. We saw him go head-to-head with Iron Man in Iron Man 2, and over time he’s become a signature part of the film’s image. This much is clear at Gala Bingo, where there are a number of pop culture-themed games embracing popular characters, films, and shows, and War Machine is almost as prominent as Iron Man on the Iron Man 2-based game. The game’s “missile attack bonus” even calls to mind the greater firepower of a War Machine suit. Beyond this, the character probably featured even more prominently in Iron Man 3. Trailers have shown images of a badly wounded (or possibly dead) War Machine, but that seems deliberately misleading. In the end it’s hard to imagine Falcon having a bigger impact than Marvel’s greatest sidekick. Edge: War Machine (Team Iron Man). There’s not really anything to suggest that these two in particular will go head-to-head. And in fact, all of the match-ups we’re piecing together here are simply to pit one team against the other. These specific characters may not be matched up in battle. Nevertheless, it’s a fun concept that each team has a bug. On Cap’s side, Marvel’s tiny comic hero, Ant-Man, will make his second cinematic appearance. And on Iron Man’s side, the most anticipated newcomer in Civil War, Spider-Man, will swing into action. Frankly, this one isn’t close. Ant-Man was a pretty popular character and a lot of people appreciated a lighter, more openly comedic side to Marvel; but the Ant-Man film nevertheless came close to being the lowest-earning movie in the MCU, according to Forbes. Spider-Man, meanwhile, is already a sensation. Despite two franchises having already come and gone this century, fans can’t wait for the new Spider-Man to be injected into the MCU, and Marvel is well aware that he has to be a hit. Edge: Spider-Man (Team Iron Man). Black Panther is another exciting newcomer in Civil War, and fans can’t wait to see Chadwick Boseman’s take on the popular character. He and Hawkeye are essentially the extra soldiers on each team, not easily slotted into a category or a specific purpose but there to do their parts nonetheless. Frankly, this is a battle that’s difficult to determine. On the one hand, Black Panther needs an explosive debut to pick up momentum for his own upcoming solo project. On the other, Hawkeye’s been around the block and Marvel clearly made efforts to expand on and improve the character with some backstory in Avengers: Age Of Ultron. It seems both ought to acquit themselves well for the sake of the MCU. Edge: Toss-up. By our estimation, Team Iron Man wins. But we’ll see on 28 April if that’s really the case.